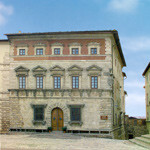 The historic Palazzo Contucci is a perfect example of Tuscan Renaissance architecture. Built by Antonio da Sangallo the Older during the early years of the sixteenth century, it is one of the most important buildings on Montepulciano’s famous Piazza Grande. The Palazzo rises over the monumental Contucci cellars (the website of the family business is consultable at www.contucci.it), them selves built on the medieval walls of the ancient city. 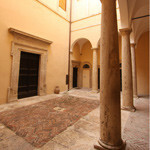 The internal courtyard, also designed by Sangallo, is paved with the typical Tuscan terracotta bricks and boasts classic Renaissance travertine blocks, both in the wonderful arcade and in the cornices over the doorways of the ground floor apartments. In the summer it is a pleasure to take refuge from the heat within the cool of the high walls and to enjoy the vision of the masonry as it project into the clear blue of the Tuscan sky. 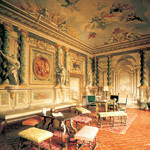 The first-floor Sala delle Feste has frescoes by Andrea Pozzo, a famous eighteenth-century sculptor and painter. Here can be admired one of the few cycles of profane art ever done by the Jesuit from the Trentino region, who almost always painted religious subjects. Renowned for his perspectival tricks (or trompe l’oeil), Pozzo here offers an amazing example of the exuberance of baroque art. Palazzo Contucci is still, as it has been for centuries, the family home of the Contucci family and for this reason the use of the Sala delle Feste has to be compatible with the inhabitants’ daily life. The family rents out the premises, at its sole discretion, for conferences, presentations, or other events that last only a half day (either morning or afternoon). The space is not available for Lunches or Dinners, nor for events involving large numbers of people. 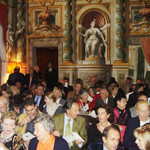 In fact the Sala delle Feste can only seat up to 60 people and the Courtyard 40 people, a number which can be slightly increased for Drinks or Finger Buffet.